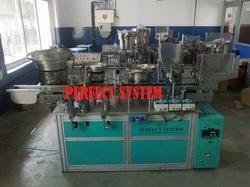 We are a foremost Manufacturer of a high-quality range of Pen Making Machine. We have developed a well-installed infrastructure. Oneness Communications is engaged in manufacturing of DF Ball Pen Filling Machines, Ball Pen Making Machine, Velvet Pencil Making Machine, etc. Sketch Pen Tips Plant, 37 KW. Production Rating: 2 kg TO 2.5 kg/Hrs. • 20 LANE TO 40 LANE AS PER CUSTOMER REQUIREMENT. Sketch Pen Assembly Machine With Automation, 1.5 K.w. We are amongst the most reputed names in the industry, offering Pen Assembly Machine with raw materials.